This may seem outrageous and absurd to many, but I'm not panting or salivating for the appearance of a new synthesizer. I'm actually content with the vast numbers and varieties of instruments that presently exist, and I would be happy if nothing new appeared for some time. Sure, I've said that I'd like to see a replacement for the Prophet 12, but that's only because the Prophet 12 was recently discontinued. I'd like to see the current lot of synthesizers come to full maturity and be rid of all bugs and flaws, to the degree this is humanly possible. Not that I'm against new instruments; it's just that the drive for the new is so excessive, and new always leads to the retirement of the old, so that there's a constantly revolving musical door that upsets the musical equilibrium necessary to mature creativity. It's not more synthesizers that interests me, but more synthesizer music, more mature artful use of the fabulous instruments that presently exist. I wish the assortment of instruments could remain more stable, that they would stay with us for much longer periods of time, and be maintained. The P12, for example, should have remained available for years to come. It was such a fabulous musical instrument. But no...the market, gear lust, new, new, new and more, more, more. I know, it's a business. I get all that. But it's a shame that the musician's needs, rather than the musician's pockets, are not a greater part of the story. Pardon my use of the "C" word. I'm content with the instruments that already exist. I would just like to see a stabilization of the tools that make for good music, rather than the mad dash to surpass in complexity the last batch of machines, and the effect that a previous batch of machines must be retired. Just give me a Poly Evolver Keyboard, a Prophet '08, a Prophet 12, a Prophet Rev2, or a Prophet X, and keep it in production for twenty-five years. Let it mature and be perfected by its designers, and let me grow old with it, knowing that the company will all-the-while maintain it, the parts will remain available, and I will eventually know that instrument like the back of my hand and use its capabilities like a master, for the simple reason that I've used it for so long. I know - it's far too much to ask for...which stinks. Interesting point of view. I can understand your reasons for seeing things that way and respect that completely. I am a great fan of the manipulation of sound for the sake of sound manipulation. That said, I have learnt to play many musical instruments and have a deep appreciation for the skills and devotions of those who achieve great levels of musicianship and presentation of music for the enjoyment of an audience of any type. I have enjoyed performing music for others and do miss doing so these days. Even just sitting in front of a fullsized keyboard and playing some of the pieces I taught myself when learning keys inspires me to stop twisting knobs and a directing signals and just play music (in a way that a guitar just doesn't seem to do though I am far more proficient a guitarist). But that's not going to happen, I'm not going any time soon and I won't pretend I'm about to put my patchleads and reference charts away! Of course there will be those who will turn their nose up at that ideal and the the instruments I've been impressed with, in the same way that some musicians say that the synthesiser and the entire electronic musical world is not music and has no merit to it at all. But that's only means that those instruments are not what brings joy to their lives. I feel content also that I am seeing an expansion on what I thought was becoming stagnant. The number of instruments that don't resemble instruments is wonderful to my ears and eyes. The encouragement of the instrument makers to do something that doesn't resemble a traditional musical act or performance is inspiring. I don't expect every company to be constantly pushing the envelope when it comes to making new products and like yourself would love that certain companies produce a particular product in one form of the next 25yrs. If I can count on Sequential to have a Prophet for me to buy in 10yrs time or Moog to have a Mini, it's something that I will get around to owning. But right now and for the silly sound sculpting that I do for my own entertainment, my Tetra will suffice while I continue to add what are currently unusual sounds and methods of creating music to my palate and technique. I can actually relate to that very well for various reasons and I was quite happy to see a rather moderate NAMM in the synth department, i.e. one without dozens of new flagship products being announcement. I still find certain aspects and questions about innovation interesting from a theoretical and scientific point of view and simply because I’m interested in synthesis and technology per se, but I'm far from lusting for new instruments year after year. One of my main GAS killers of recent times has in fact been writing reviews on a monthly basis. Not because it has turned everything into a nauseating job-like experience, but because you get exposed to a lot of redundancy that is to a large degree fashion-based only. While it’s nice to have the privilege of being able to spend a couple of weeks with new releases, parts of that experience can feel a little samey after a while: yet another nostalgic drum synth, yet another groove box, yet another sequencer, yet another tiny synth box designed for tweezer operation, and so on. All that doesn't turn any of these devices into bad instruments, but it shows that there's a lot of hype and lots of quantity first and foremost, which is no news really. Certain boutique or rather esoteric machines are of course excluded from this list, whether I personally feel like I need them or not (I simply appreciate them being available because they make a difference and add variety). Now, it's not so much that I began to suffer from a grumpy old fart syndrome. Would I have preferred to have had all of today's options available when I was a 16-year old? Hell yes! Because one of the benefits of today's situation is that there are plenty of new affordable devices available to get you going, whether it's in the realm of software or hardware. But my current personal situation is not that of a newbie and I’m actually quite happy with what I’ve got. This doesn’t mean that I couldn’t imagine to add a few more devices here and there. But I’ve grown more picky about that in the sense that they’d have to be very specific devices that do enhance my present setup in fields that are currently not available to me, granted I’m interested in those other areas. And then there are just general considerations which make me content with my current setup. One of them being that I prefer to be a minimalist. Albeit I like the notion of each of my instruments taking over a particular task just like a single musician would, the vision of a studio space cluttered with synths up to the ceiling would be horrifying to me. Because life is too short and there are only so many instruments I can make use of at the same time. I also prefer to try to get the most out of my instruments, even if they don’t happen to be experts in everything I’d like to achieve sonically. The latter at least leaves me with a limitation that I then have to overcome with imagination, which is always a good thing in my book. And then there’s also the fact that albeit I have a relatively small setup, I don’t use all of my synths at the same time anyway. So there are natural breaks when it comes to working with particular synths. Returning to some of them after a couple of weeks also keeps it fresh, particularly in the case of the Pro 2 due to its massive feature set which has just been expanded recently. As a result, there’s always a lot of rediscovering and learning new things involved. Another aspect is related to rather artistic considerations if you like. That mostly affects my need for another poly synth, for example. Over the past few years I’ve grown to appreciate more to work with independent voices rather than with homogenized ensembles as represented by most traditional poly synth sounds. It’s just a thing I find more joy in when it comes to arrangements. Even if I would lay down a basic track played with a poly sound in order to archive an idea, I would then often splice up the according MIDI track into 4, 5, or 6 independent tracks, make some note adjustments if things seem too stagnant (which is basically the digital version of writing sheet music), and finally assign them to different sound sources. And since I don’t feel the need to perform as a one-man-band or an orchestra but simply prefer to arrange and record stuff, I have no problem with lots of multi-tracking for that purpose. So I guess you could say I became more interested in polyphony in the original Baroque sense of counterpoint techniques and the combination of different voices rather than in the sense of modern keyboard-based instruments. So that definitely narrows down my need for a collection of different poly synths in a significant manner. All that said, I do understand your original statement and don’t feel ashamed to chime in by saying that I’m content as well for the most part. There are always a few elements I’d consider swapping (replacing my Sub37 with a Grandmother is such a consideration), but at the same time I know too well that this wouldn’t change a thing about making music. So I definitely don’t feel pressured to change things in order to make better music, let alone change or enhance my setup on an annual basis. In that regard I could very well live with new products being announced only every 5-10 years, albeit I’m aware that this is not how things work from a market-driven perspective. The problem with the speed of new synths coming out, and everyone wanting "the latest new stuff" is that no one ever gets to perfecting their skills with the synths they already have... i myself must crawl to the cross with this as that was a BIG problem for me as well... hoarding synths, and never really getting to the bottom of them. Really many synths, even the ones from the 80's and 90's have never really had their full potential be seen... I recall many of my earlier synths that had immense potential, but no one ever took usage of it... let me name just a few: Yamaha FS1R, Yamaha EX5, Poly Evovler, Prophet 12 and many others... many of these can do so much more than anyone have heard, simply because no one dares to dig deep, and give them the time they deserve. This simple fact even makes new synths with vastly more features a complete waste because they will never be used to full potential... people run a few oscillators thru their filter sweeps, judge them by that, and that is about it... many synths of the past could have been classics, if the right people, with the right skills had given them the time they deserved, and I'll dare to say, that many synths of the 90's have so much hidden potential in them even today, that they could easily compete with the way the modern day synths are being used, if they were just used to full potential. I find though, that much of this is because manufacturers are getting into a "feature frenzy", rather than focusing on playability... many users either do not have the knowledge and skills to use all those features, and just use the basics, or the features simply require so much technical skills that it becomes unintuitive to use the features in a performance... we could really need new instruments that had less many features, were more specialized in what they do, and have their interface and performance parts honed for playability. I second that. For the reasons you've mentioned I still find it baffling that the Evolver still seems to be largely overlooked or forgotten, especially when it comes to current hybrid designs and discussions thereof. As such, it still is a very contemporary synth. @SacredSynthesis — I agree with your sentiment. 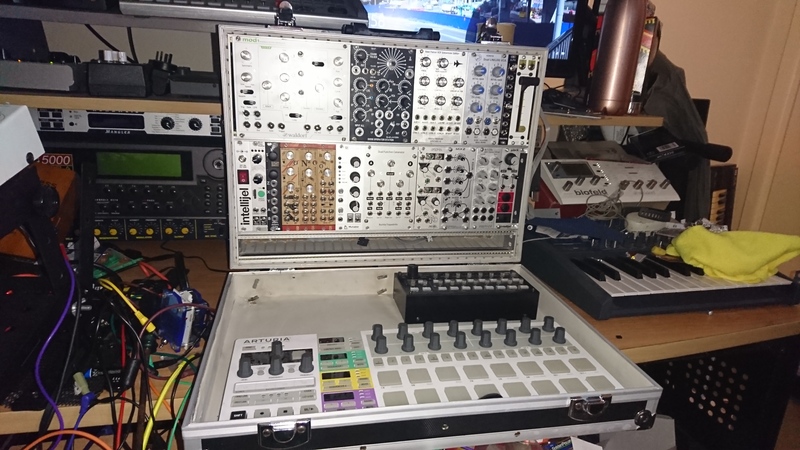 Developed a synth / platform for a couple decades, support it, grow it mature it.... I’m just not sure that it would be economically viable for a company to do that. I know we rarely discuss software here, but I’d like to point to Spectrasonics as an example. Omnisphere has been in continuous development since 2008 (2002 if you consider Omnisphere to be a continuation of what was Atmosphere)... of course I realize that this is easier to do with software because the end user is responsible for hardware upgrades, but I wouldn’t be surprised if Omnisphere 5.0 were released in 2028. Unfortunately, that is harder to do with hardware. If the Prophet 12 were still in production, I would think it’s sales would be greatly impacted by the new FPGA based synths that are in (and surely coming to) the market. Thanks be to God, I think you guys actually got my point. So often on these forums, people have knee-jerk reactions to views that are even slightly out of the ordinary. After NAMM, I always take a renewed look at the broader gear issue in a critical way. I had my own hopes this year, and obviously they weren't met, but I hardly even care. But it brings to mind, not only that craving something new often becomes an end in itself, but even more, that the new instruments result in the loss of older instruments that might have been an important staple in the making of music. And that's what I'm getting at - this constant loosing of that which served our purposes. It's darn frustrating to see these sacrifices made over and over again, all to feed the great big monster. Thanks be to God, I think you guys actually got my point. I'll raise you one... Not only did I get your point and agree with it, I acted on it -- I was so "excited" by this years NAMM releases that I just snagged a Mint Prophet 12 off of Reverb. I had had a Prophet 12 a while back, sold it to help fund my PX, and now realized that was a mistake. Yes, Shaw, that's a classic example of my point. That Prophet 12 was one fine creation. Now, why must it be retired? And this is where sweet music is thrust aside and business shouts: "To feed the monster!" This is one reason people go for vintage instruments - they've been removed from the turmoil, from the hectic ups and downs of the market and its ever changing sparkling merchandise. Shaw, you go and enjoy that Prophet 12, and keep it for thirty years of music-making, if it will last that long. And meanwhile, a thousand inferior synthesizers that might have tantalized you will have come and gone. And you will have missed nothing. Just to clarify: Acquiring the PX was NOT the mistake. It is one of most versatile synths (in terms of sonic variation) that I've ever owned. I put it up there with the K2000 in those terms. The mistake was selling the Prophet 12 for any reason -- other than food, of course. I hope none of us are ever in that situation! The K2000 is another example of what SacredSynthesis was talking about. Of course, the Kurzweil Kxxx series hasn't been produced in forever, but the VAST architecture lives on and has indeed continued to mature in Kurzweil's other offerings -- The PC3Ks, Fortes, etc. I suppose the Sequential mod matrix could be seen the same way. The Prophet 12 / Pro 2 / Rev 2 / Prophet X all build on that familiarly complex system. That was one of the main selling points of the PX for me -- the immediate familiarity with the layout, controls and modulation system. I was relieved Sequential held off from showing anything new at NAMM. I cannot afford another synth now . While I do like looking at all the new gizmos found on YouTube, sometimes I step back and think....ok, interesting technology, but man, that really sounds sorta crappy. Granular was the big thing last year, and like I was saying... Anyway, With a little bit of ingenuity, one can make reasonable reproduction of much of the stuff that is touted as brand new. The tools to do that many of us on this forum already own. PEK and P12 lead the list in that regard. I'm pretty confident a skilled user can coax sounds out of them to stay competitive with anything on the market. And to this day, the only choir patch I've come across that surpasses the PEK's rendition is a sampled sound. I bought a Tandy pocket computer is 1985. It's roughly ten million times less powerful than my iPhone, but it was built to last decades, and I still use it to this day. Meanwhile, I'm on my third iPhone. I think that we often forget (or never think about) how much energy it takes to make something. When we lose sight of that, we think of things as disposable. This is a major problem in a world where resources are finite. Electronics have particularly wasteful manufacturing processes, so everyone can contribute by keeping them around for a bit longer. My own step is that I've resolved to not make any synthesizer moves in 2019. There's nothing I need, and I haven't mastered what I already have. So everything's going to remain static for a while. That sounds nice, Chysn. More contentment. Another aspect I wanted to mention was, with the constant moving on to other and new instruments, the master of any one instrument is a rare occurrence. Instruments such as the Minimoog or Odyssey come to mind. People have stayed with these instruments for decades, until they've become like fifth limbs. There are several videos of such Minimoog masters on YouTube that are a real pleasure to watch - these impressive Model D geniuses who can alter patches with speed and agility while playing them quite expressively. I love that sort of mastery of a single instrument, and seeing someone draw from it such musical power and expression. It doesn't come quickly or easily, but only by staying with an instrument for many years. In other words, parallel with an instrument's technological maturity is the maturity of the musicians who play it for so long. Imagine what a person could produce who has played a Prophet 12, say, for fifteen or twenty years. But how likely is that to happen if the synthesist is forever being tempted and lured towards new gear? It's exactly these kind of threads that makes this user forum so incredibly good! Thanks to all the people that do not just talk about tech and specifications and the newest stuff here and there. I love it that there are so many experienced users here who really think about what they are doing. Sometimes it's getting really philosophical, but I like that very much. I was lusting for new stuff this NAMM very hard and was a little bit disappointed by the announcements. There was nothing that I really considered buying. But after reading this thread I woke up: I really don't need anything new. With PEAK and Rev2 I have two very deep synth that I have to master before buying anything else. And to tell the truth: that is going to cost me a couples of years. There's also my old PC361 with VAST. I played it for several years now, but there's still so much to discover. I also consider VAST as a synth engine that evolved over years and is still geting better, without being something completely new. I looked at the newer Forte line very often at Thomann and could instantly work with it since my experience from the older PC3 line could be completely reused. As someone mentioned before, I think this is a really good example for the kind of product you are looking for. Another example is the Kronos. It was sold as Kronos since 2011, but the predecessors where not so different, too. There was no new Kronos every two years and the Kronos community is still waiting for a succesor, but again Korg only showed a slightly redesigned variation of the Kronos itself this NAMM. Some users hate it, but I'm really lucky about that. I would like to see a new update of the current Kronos to fix some minor things here and there, but that's all. I can't imagine that there are so many persons on this planet, who really mastered this beast completely. I think I never will. Even if the last two are not really knobby analog synth, they are really powerful workstations (I don't think there are more powerful workstations out there... if so, try to convince me ;-) ) and the long lifetime and further development of the underlying systems makes them very great products. Again, thank you for waking me up and pulling me back to the ground. I have everything I need in regards to synth. That's great to know, Jok3r. In my book, it's a sign of progress when you can hunker down with your existing equipment and draw more from it then you would if you had more disposable income to throw at the latest synthesizers. Gear, gear and more gear leads to endless instrument demos, not to serious music. I'd say the key is for each person to discover that singular instrument that strikes the musical sweet spot within. As long as we're swept away by gear lust, we'll never learn to settle in with that instrument and work towards our musical potential. For me it's all about avoiding redundancy. That's why I don't go after a bunch of mono synths or even a bunch of analog poly synths. I'd like each instrument specializing in a voice that's completely different from one another. That's really how I avoid major GAS. I try and perfect a specific approach to each instrument. I'm glad there wasn't any major announcements at NAMM. In fact, the only thing that caught my eye was a new Gibson SG that I wanted for a while and the new Elektron Model:Samples is neat. Everything else was just okay. Again, you've definitely gotten the gist of my original point. Personally, I think Sequential is finally doing an excellent job in the area of maintenance, especially for a small company. Yes, there was trouble in the earlier years, but they've heard our voices and responded. I thought the recent updates to the Pro 2 came right out of the blue. I presumed that instrument was a thing of the past and was so pleased to see the company give it further attention. But of course, the Pro 2 is bound to go its way sooner or later, and that's what bothers me. And this is where everyone can shout, "But that's the music business!" I know, I know. But it stinks for the musician. You make a good point, Razmo, in that following the thinking of this thread might result in less business for Sequential, but I'm not sure about that. I'm not suggesting in any way that the ideas expressed here would work; I'm just dreaming out loud, so take it for what it's worth. But if synthesizers remained in production for much longer periods of time, if companies put a little less time into research and development directed at churning out new products on a frequent regular basis, but more into maintenance, then wouldn't the huge amount of time, resources, and frustration spent on dealing with the problems with recently released instruments be substantially reduced? At least, people would know for certain they'd eventually be resolved. Just consider what happens around here in the first year of a new instrument. Look at the anger of users and the difficult situations the company finds itself in. One new instrument is released, and long before its bugs and flaws have been worked out, another new instrument is released, to the exasperation of those who just bought the previous instrument and feel it's not being given sufficient attention. Remember the Tempest, or even the Tetr4? Remember John the Savage and others? I used to read the Tempest posts purely for entertainment. "Pow! Wham! And Tracy's out cold! Now Carson's standing again But wait, Tracy's back up and John is staggering. Holy moley, John's down for the count!" Sad to say, it was great fun reading those posts, but it certainly wasn't fun for those directly involved. And is it at all necessary, or is it due to the mad rush for new stuff, to the neglect of the old? It just seems to me that, if the new instruments appeared less frequently, and the existing instruments remained in production for many more years and with constant attention, those of us who love and play these instruments would be happier and the companies who produced them would have to deal with less grief. And of equal interest, we might also see the appearance of instrument masters, of individuals who, because it continued in production for many years, felt comfortable remaining with a particular instrument - say, a Prophet '08. And as a result, they could become incredibly proficient with it. A Marc Melia is the perfect demonstration of my point; but he is the exception, not the norm. And how many times do you think he's been asked when he's going to get a Rev2, or even a Moog One?